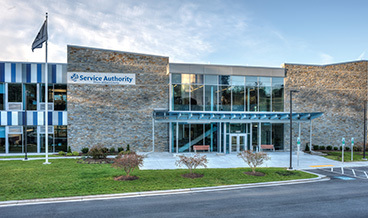 The Prince William County Service Authority is the regional leader in supplying clean water and superior service to a large and ever-growing metropolitan population. We are a nationally-recognized model for excellence, sustainability, industry best practices and environmental stewardship. Consistently high quality, reliability and customer satisfaction levels -together with fiscally and environmentally sound practices, engineering and effective use of state-of-the-art technology have earned us this leadership role in the community and across the utility industry. The Service Authority has earned the trust of our customers, government, developers and other community partners for fair and efficient policies, engineering expertise and a collaborative approach to projects and problem-solving. We measure success by performance, including top independent ratings for customer service, regulatory compliance and safety. Chartered by county and state government in 1983 to run as an independent agency, we blend our civic priorities with a data-driven, business culture of accountability to make sure every dollar is spent wisely and in the best interest of our customers and the community. 100% regulatory compliance for seven-years running at the H.L. Mooney Advanced Water Reclamation Facility. 99.999% reliability and availability for water and sewer service. 90% on annual, independent customer satisfaction surveys. Numerous state and national safety awards in the last 10 years. Strong partnerships with developers and other water utilities. The Service Authority’s best practices have been shared industry-wide through trade groups. Behind every convenient turn of the spigot or flush of a toilet is a complicated lifecycle to clean water that involves massive infrastructure investments and high standards around safety, quality, environmental protection and other factors. The more you learn about clean water, the more you see the value in what the Service Authority does as well as some of the unseen costs that go into high quality water service. The Service Authority oversees a massive infrastructure of more than 2,200 miles of pipeline handling up to 56 million gallons of water a day and 43 million gallons of wastewater a day. Maintenance and repairs are performed daily, while the utility focuses on upgrading parts of the system that date back to the 1970s. The timelines for water and sewer projects can stretch for years, even decades. The Service Authority is constantly working to set rates that are steadily affordable while ensuring adequate funding for much-needed work to keep its system among the most advanced anywhere in the U.S. Whether on the phone, online or in the field, the Service Authority provides nearly 90,000 customer accounts with personalized customer service interactions, almost all of which are still one-on-one conversations. Whether it’s problem-solving or setting up new service, Service Authority professionals are knowledgeable and friendly in providing the best possible service for the utility dollar. The Service Authority is a fully engaged community partner, not just a water and wastewater utility. The utility is active in regional groups like the Metropolitan Washington Council of Governments,Virginia Water and Wastewater Agency Response Network, Upper Occoquan Service Authority, Northern Virginia Regional Commission and others. The Service Authority practices environmental stewardship through our own advanced engineering practices as well as school and community partnerships to safeguard the environment. The Service Authority also actively works with local government and learning institutions in the region on educational curricula, science fairs and other initiatives to inspire and train the next generation of industry professionals.